I seem to have 2 issues. 1. some of the fields are displaying on top of each other. i.e when i select 'do you have membership' the 'enter your membership number' is stacked / overlayed on to my first field. Hi, for the overlapping text please see this thread for some css injection on how to fix that was suggested to someone else who was experiencing the same problem previously: http://www.jotform.com/answers/50421-Fields-overlapping-in-Chrome. Also, I see that the form that was originally associated with this thread was deleted and I only see one form available in your account currently, is that the form you wish to add these to or could you please provide the url if you are creating a new form for this? Thanks! As for the conditional logic giving you problems please refer to our Conditional Logic Guide to ensure that you have input it correctly. Wow! Thanks very much. That seems to have worked. If you need more help or have other questions with anything else feel free let us know! I still seem to be having difficulties getting my conditions to work. Once again, your help would be appreciated. The problem relates to the one form I have on my account. Can you please tell me what is the FORM ID or name, so I can make a clone and try to find the solution for the conditional logic problem? Hi, since you only have one form so far on this account, I was able to test it. As for the date condition, please try using a proper label for the field with 'Click to edit' only as name. When you look for it in the condition wizard, this appears as 3 dots only (...). The logic seems to be conflicting since there are more than 1 field with labels as (...). Please update us if this is still not resolve. 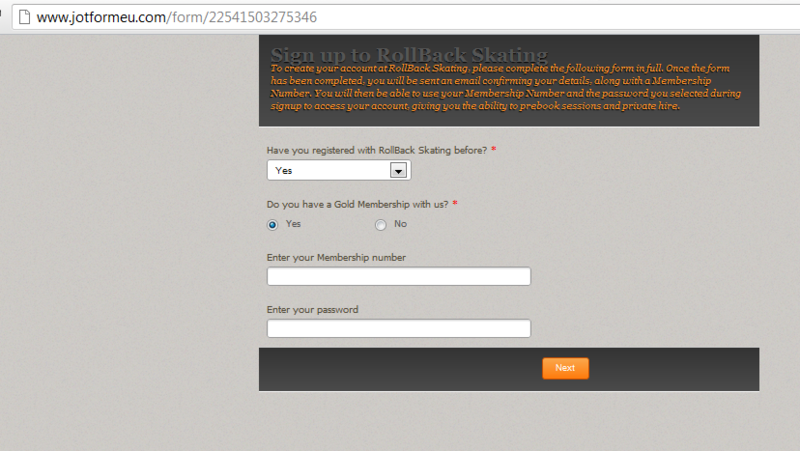 It is when the 'no' option is selected which brings up another field-> 'would you like gold membership', my condition should then show the subscription field AND the 'sign up / login' tab. For some reason it doesn't. I will adjust my labels, but basically what conditions need to be in place to show a field if dates below a certain year (i.e below 16yrs) are selected? You mean to say this? When you select "yes" or "no" on the field "Would you like Gold Membership"?, the two fields shows (the member number and password field). Is this correct? For the age condition, please do not use Birth Date Picker tool, this can't be used in conditional logic currently. I believed there's a known bug for this tool and it has already been addressed to our developers. However, using DateTime tool should solve the problem. Just update us if problem with conditions still persist. Thanks! This is correct, but when you select 'yes' the 'subscription' field AND the 'sign up' field should appear. If you select 'no' only the two fields above AND the 'sign up' field should appear. In other words, the applicant is given the opportunity to apply for gold membership by subscription if they select the 'yes' field. I will try the dateTime tool for my age condition. Sorry for the delay, it took me an hour to learn your form conditions. I'm pretty sure there's a conflict with your conditions that's why it's not working properly. To be honest I still dont get it so what I did is I've cloned your form, deleted the unrelated fields (so we can focus on the sign up and subscription fields) and recreated your forms conditions. You can check and clone this form to http://www.jotform.me/form/22602205375445? to figure out what conditions are needed. Also, just want to inform you ahead about the page break tool. Since your subscription field is on the last page of the form, it can't be displayed on the first page when condition is met. Hope this clarifies a bit. Thanks! I have changed the 'date of birth' field to the 'dateTime' picker and removed the page breaks. The form now works perfectly. Thanks. To get the form to work I had to remove the page breaks, but is there a way to incorporate the page breaks or similar, so that the form is not as long/cumbersome to the viewer?? I have taken quite some time to understand the logic and all the work done on the form and tested a number of different options. It seems to me that the best way to make the form easier for the Customer to view and also to modify in the future would be to break the form into different forms (registration form / application form / payment gateway form). Unfortunately, there are conflicts whenever using conditional logic and fields used to collapse or to divide the pages. We apologize for this inconvenience. I also wanted to point out that our forms don't offer built in login capabilities as the ones that you have used on your form.